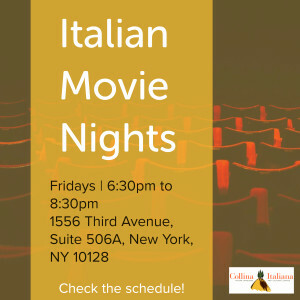 Italian Classes for Adults may be started mid-session or at other times not listed on the schedule. Please inquire (212) 427-7770 or email for more information. Level 1 is designed for students who need basic Italian knowledge. The course focuses on Italian phonetics, common phrases, verb conjugations (present tense), and grammar. 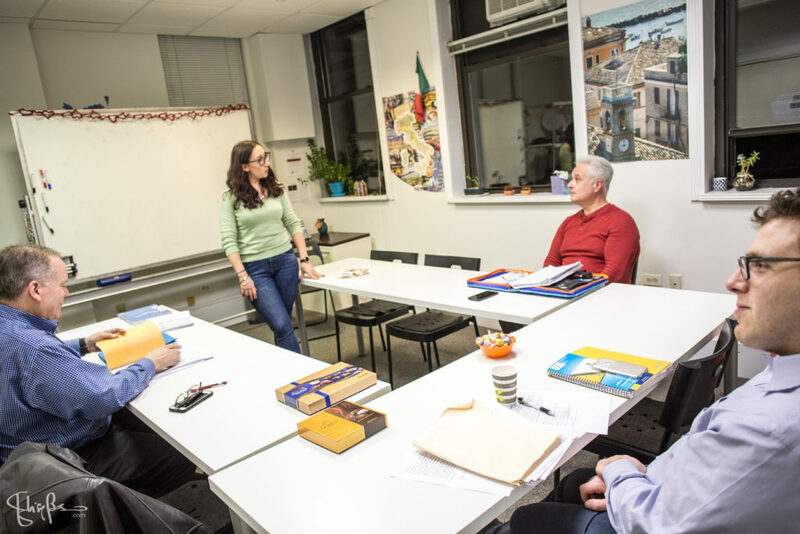 The course provides students with a foundation and basic tools to interact effectively in everyday Italian. Students can expect to master simple sentences to hold beginning level conversations. 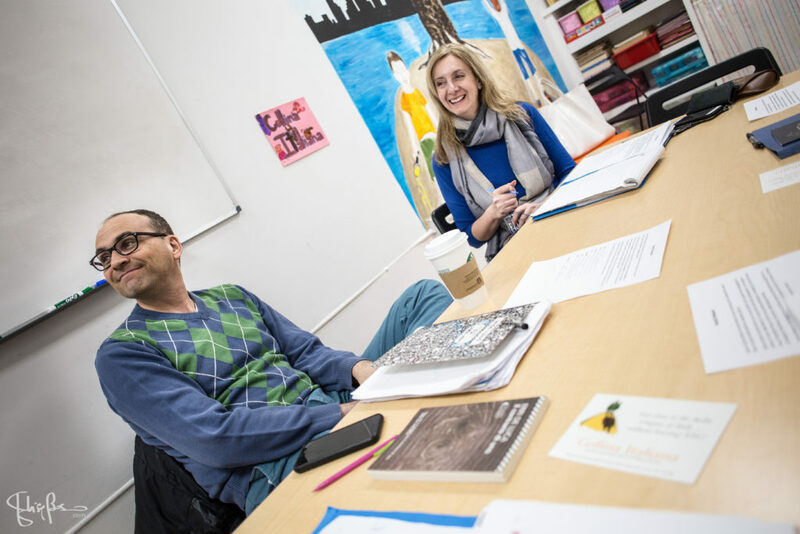 Engaging students in more advanced beginning conversation and writing skills, Level 2 is designed for those who want to go beyond a basic knowledge and understanding of Italian grammar. Students master the past tenses and study grammar through in-class oral and written exercises and by listening to dialogues in Italian that is spoken today. Focusing on the future tenses, new vocabulary, and adverbs, students engage in extended conversations. Level 3 reinforces the basic rules of grammar and introduces new tenses and how to use them. Video and song are incorporated into the class to continue learning a more modern Italian. Students master the present, past, and future tenses as well as direct/indirect speech enabling them to fine-tune their conversation skills. By the end of Level 4 students grasp the breadth and depth of Italian grammar and are able to apply it in different situations. Level 5 enables students to converse with native Italian speakers, to tell stories, and effectively summarize a movie or article. Students study advanced grammar, such as the conditional and subjunctive tenses. The class is dedicated to listening and speaking exercises with a focus on increasing the fluidity of conversation. Students continue to conjugate complex verbs and study grammar – all put into practice during in-class conversation and writing exercises. Students can express ideas, read a variety of texts, and interact with ease in Italian with classmates and the teacher. There are multiple screenings of films and videos, discussion topics, and written work. Students are introduced to the various forms of the subjunctive that are commonly used in spoken and written Italian. They learn complex idiomatic sentences combined with conditional and subjunctive tenses to express themselves at a near-native level. Assignments in reading, writing, and oral presentations give students the tools to communicate in every given situation. You made it! Level 8 faces all hypothetical constructions, combining gerunds, conditionals, and subjunctive tenses including pronouns and direct/indirect objects. Students exhibit mastery over the language: they can write professional letters as well as give public speeches without any doubts or fears. With this class you can call yourself “a true Italian”; nothing will scare you anymore. You can pack your suitcase and move to Italy. It is a 2-week intensive Italian language course. Class meets four times a week from Monday – Thursday. Beginner: It is designed for students who need basic Italian grammar. The course focuses on Italian phonetics, common phrases and expressions, basic dialogues, and grammar. The course provides students with a foundation and basic tools to interact effectively in everyday Italian. It addresses a traveler’s need for basic conversation skills in Italian before taking off from the airport. Please inquire about our private and semi-private Italian classes. 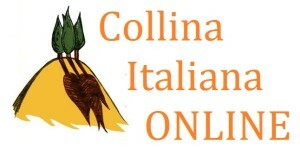 Collina Italiana offers private classes both on- and off-site. Private classes are very flexible. The instructor will help you customizing classes according to your needs and goals. All films are in Italian and subtitled (English or Italian). FEE: you can purchase 1 movie or a package of 5 movies (to be selected in advance). Leonardo, Michelangelo, Raffaello … Italian artists have produced some of humanity’s greatest art, images that convey the vast range of human experience. Looking closely at paintings and sculpture from ancient to contemporary Italy, Collina Italiana students will investigate objects from the world’s most important collections, learning about Italian history and culture in the process. 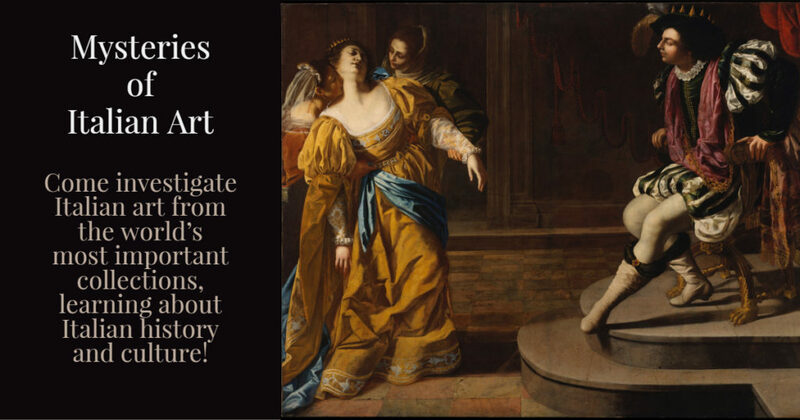 The series includes celebrated and lesser-known masterpieces, selected to provoke curiosity and inspire lively conversation—in other words, fun! The five sessions will meet once a month for a 90-min session, with a break for prosecco and snacks. All session are in Italian and English. FEE: you can purchase 1 class or a package of 5 classes. Students in conversation Italian classes read from a variety of texts selected for their skill level. Questions about the readings are entertained and students engage in lively discussion. Vocabulary building, choral repetition, and pronunciation are also part of the program. Students create dialogues and study contemporary Italian through songs, videos, and films. Learn Italian at home or from your office with our online classes (Skype Voice Call offered for beginner, intermediate and advanced level). Material will be sent by email. Please inquire about the schedule. Reinforce your Italian by studying everyday phrases and proverbs that won’t be found in a dictionary! Common sayings, used by speakers: Formulas, proverbs and short sentences that convey a fixed idea or express symbolic and metaphoric value which goes beyond the meaning to use. All requests for full refunds (minus a non-refundable deposit of $40) must be submitted to Collina Italiana by mail, email or fax and received by CI prior to the first day of class. Pro-rated refunds are allowed after the first class but no refund is given after the second class or for missed classes. There is a $20 fee for mid-semester class changes. Refunds are issued by check or credit card. Please take in consideration that CI does not prorate classes for group courses. One hour make-up private class is offered: $45/h (instead of $90/h). The fee for Private lessons is charged in full if cancellation is made less than 24 hours in advance.